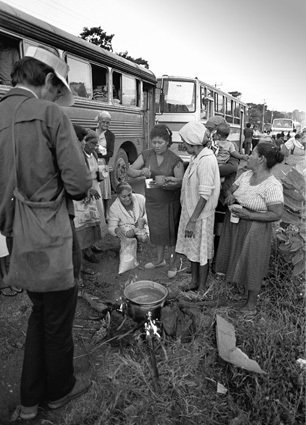 The Salvadoran committe had worked for a year planning for our arrival, with high hopes that the Duarte government would allow the internationalist marchers—us— to join them. 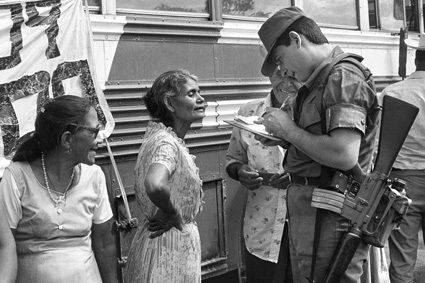 When we were refused entry, the Salvadorans redefined their own internal march as a correlate of ours. Six of us sneaked in to be with the Salvadorans, and they were joined by 5 or 6 Americans from stateside. Here the situation was far more sinister than it was in Honduras. My notes show several entries for the happenings in El Salvador, from the people who were there: a report by Adelaide; what appears to be a private report by Sonja Iskov, the day after she rejoined us in Guatemala City; comments by Brenda, Lynn, Helga, and Tom. I have merged these into a single narrative without specific attribution—at this late date it doesn't matter who said what. But, all the reports agreed on one thing: El Salvador, Washington's showcase "democracy", was a fascist state in all but name. All the photos on this page but the last were were taken by the intrepid Sonja, the only photographer among us who went to El Salvador. Sonja was there from January 3 to January 13. If any marchista who was part of our El Salvador contingent happens to visit this page, I welcome corrections and/or additions. At the church a meeting was held to decide whether they should be there at all. Someone said that the international marchers were causing problems for the internal march, but my notes give no details—only a separate comment that there were three Salvadoran madres groups that didn't coordinate well even with their own compatriots. 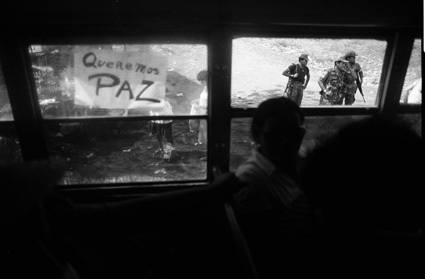 The march began the next morning, January 3rd, with San Francisco Gotera as the first goal on the way to the liberated zone—where the guerrillas were in control. 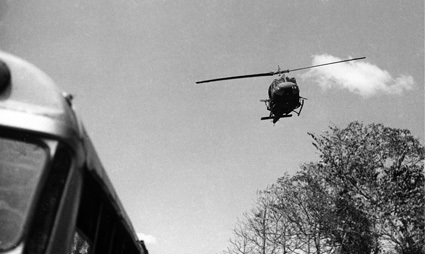 Some 500 people boarded 13 buses, and there were two cars for journalists. The military set up checkpoints, and prevented the marchers from getting very far into the countryside. At sundown, the march was ordered to return to the previous checkpoint, where they were ordered either to a third checkpooint, or back to the one whence they had just come. In any case, the spent an anxious night on the	highway and in a coffee field. The next morning about 400 of the original marchers began again toward San Francisco. The military had told the marchers that they had to travel during daylight, but now did not allow them to continue. 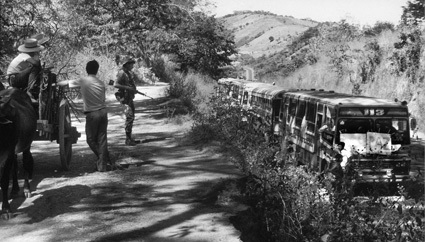 They were stopped every 10 kilometers and ordered out of the buses. 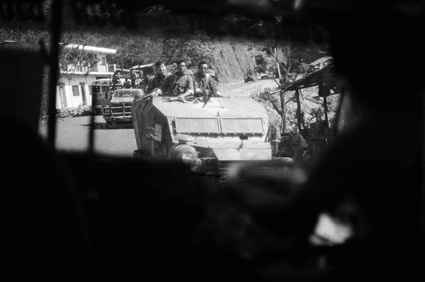 Their photo ids were checked, and military cars and helicopters did their best to intimidate them. Soldiers found sheets of peace and justice songs and deemed them subversive. The marchers were held on the buses without food or water. That day, a soldier singled out Salvadoran marcher Brigido Sanchez, 46, and accused him of being a guerrilla. The head of the army arrived and "hugged the prisoner warmly, saying 'don't worry, you're just going with us.'" 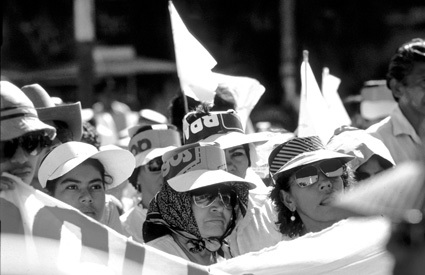 The marchers called for the International Red Cross, without success. All efforts to prevent Sanchez's arrest were in vain. 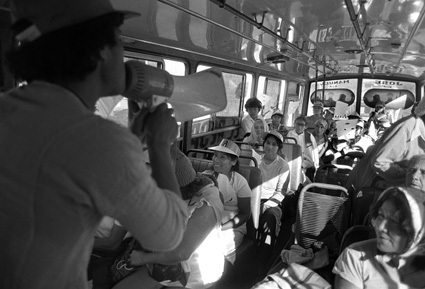 The marchers returned to San Salvador that night, and slept in the buses in a park. The next morning, January 5th, the marchers decided to occupy the Basilica. 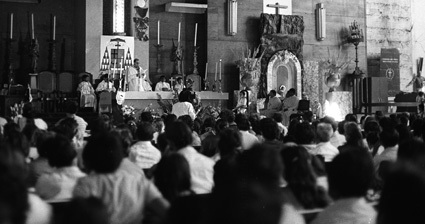 Archbishop Rivera y Damas opposed this plan, but gave the march permission to sleep in the basement of the cathedral until January 8th. Torril sent a note to the marchers in Nicaragua asking for many more of us to come to El Salvador, but I don't recall that happening. My notes indicate that on January 7, after two nights in the cathedral, the marchers—now "only" 300 strong—again tried to get into the campo. They were again harrassed at checkpoints and prevented from reaching their goals. They returned to San Salvador to spend their last night at the cathedral. 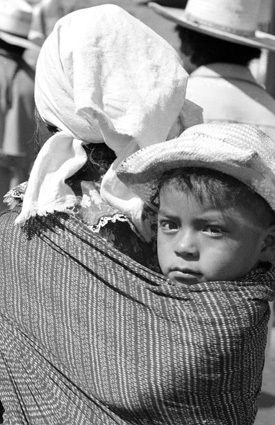 The Salvadoran mothers told hideous stories of the torture and murders of their sons and husbands. 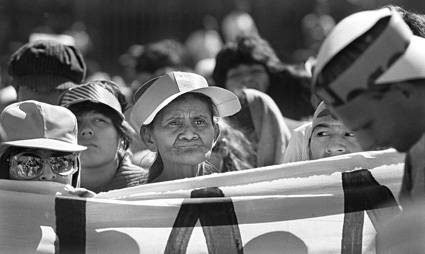 There was no one on the Salvadoran march who had not lost a loved one to the repression. The internationalists were deeply impressed by the courage and committment to peace shown by our Salvadoran counterparts. If my interpretation of my 20-year-old notes is correct, there El Salvador had four major instruments of repression—all paid for with U.S. taxpayer dollars, of course: the army; N.G.—National Guard; N.P—National Police; and T.P.—Treasury Police. I have a vague sense that the Treasury Police were the most feared and the most brutal. On Saturday, January 11, some four to five thousand people demonstrated in favor of la marcha and peace. We learned on the 18th that Archbishop Rivera y Damas had sent a letter to Salvadoran president Duarte asking—in vain— for Brigido Sanchez's release. The marchers in Nicaragua and Guatemala were asked to call home and urge people to call Washington demanding that Brigido Sanchez be released unharmed. I called my Unitarian Universalist church office, and my social activist friend/church member Bonnie for good measure. Sanchez was visited by two human rights groups: first, the official Salvadoran Human Rights Commission; the next day by unofficial human rights advocates. Tom, from Minnesota, spoke with U.S. Embassy official David Becker in San	Salvador. (Becker is no relation to me, as far as I know.) Becker told Tom that Sanchez was all right, and was just awaiting trial. Two hours later Tom heard from Sanchez's lawyer, who said that Sanchez had been badly beaten and drugged. Sanchez was also reported to having confessed to killing 37 people. and that embassy official Becker, in a shrewd career move, if not through indifference, simply swallowed whole the offical story without bothering to check for himself. The woman at lower right looks to be one of the mothers of the Argentine group Madres de Plaza de Mayo, but I'm not sure. Per instructions, she would not be wearing her large id card with the photo of her daughter, who had been "disappeared" by the Argentine death squads. 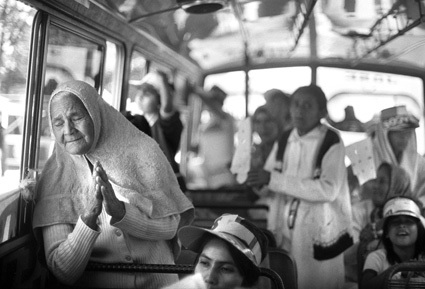 Had the late Pope John Paul II accompanied the soldiers on their inspections of the buses, he would have immediately ordered the man in the vestments, back left, to leave the bus and return to his duties at the church. John Paul was no friend of the poor. I hope you're spelling my name right, sonny. No one reported on a mass, nor on what the subject might have been. More of the American CEO's worst nightmare—poor, Third World people organized to win their rights to a decent life. Piety, trepidation, and high spirits. The landscape here looks very much like Southern California. It may not be long before we see armed soldiers and paramilitaries patrolling the streets of the U.S. 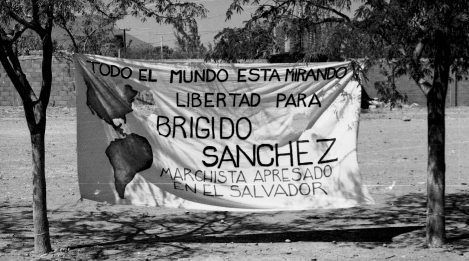 This picture was actually taken in Mexico, where we had some time for more public demonstrations of support for Brigido Sanchez. I don't know whether the march organizing committee brought banner-making materials with them. It is possible that the materials for this banner were provided by our Mexican hosts. There will be more on this on the Mexico page.